Lemon Coriander Soup is a delicious soup made with vitamin C rich ingredients like lemon, coriander, carrots and cabbage. Lemon is a rich source of vitamin C, which in turn helps build immunity from cold and cough and thus this soup makes for a great healthy recipe. This soup has the delicate flavours from the stock and the vegetables. The carrot give it a mild sweetness that balanced the lemon and the chilli perfectly.Lemon's tangy flavours make this soup scrumptious. This soup recipe is quick and easy-to-make and very light for stomach and will refresh you instantly . adding black pepper enhance the flavours in this soup. Enjoy this a healthy soup with piping hot ! 1.Wash coriander leaves and vegetables well. Chop the coriander leaves and the veggies finely. 2.Take a pan and heat 2 tbsp of oil/butter in it. Add chopped chillies, onions, garlic and ginger to this, and sauté till they look golden brown. 3.Add chopped cabbage ,carrots and corn to the pan. for vegetable stock. You can choose any vegetable of choice. Add four cups of water to this and let it boil for about 15 minutes. 4.Now that it is boiled, switch the flame off and strain the water. Remove the vegetables and your vegetable stock is ready. 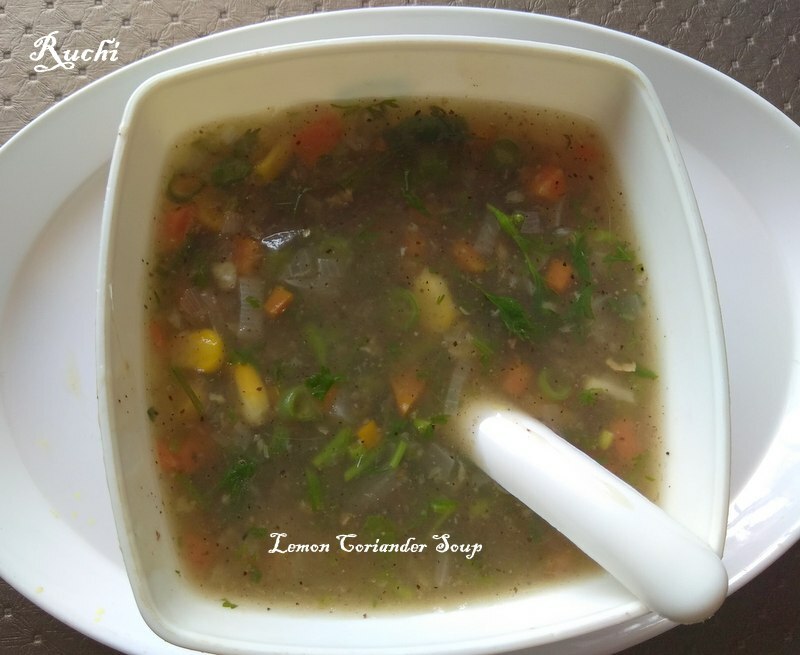 5.Add few chopped vegetables to it to make your soup interesting . (I used cabbage, carrot, onion, corn )Stir for few seconds. 6. Then add vegetable stock, green chili and coriander stem in the pan. Mix it well, let it boil for few minutes on medium flame. 7.Dissolve corn flour in2 tbsp. water. Add corn flour paste in the wok with continuous stirring with spatula to avoid any lumps in the soup. Cook it for another 1-2 minutes. 8. Finally add some salt and pepper for taste and half of the coriander leaves and salt. Mix it well. Let it boil for another 2-3 minutes on low flame. 9.Switch off the flame, Take the soup into a bowl, squeeze some lemon juice into it and garnish with few coriander leaves. 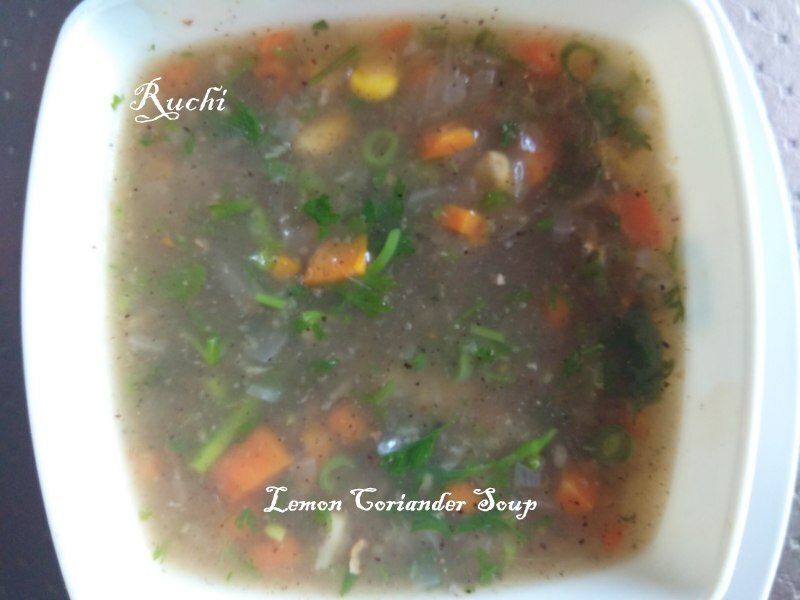 9.Delicious lemon coriander soup is ready to serve, serve hot. Note:If a clear soup is desired, add more vegetable stock and less of the vegetables. Similarly, for a thicker consistency, the quantity of corn flour can be increased as well.